In the pitch darkness, a single light reflected over the shallow waters of the Tumen river. All that was visible on the far shore was a pair of giant portraits: of North Korean founder Kim Il-sung and his son and successor Kim Jong-il. In the distance, beyond the barren hills, dogs barked, as if in rhythm. Two weeks later, I stood on the desolate, dusty hills cocooning the U.S. nuclear test site in Nevada, listening to the calming, eerie ring of silence. I seemed to hear those same dogs. I had come to find traces of humans’ encounter with nuclear bombs – the only weapon that can destroy humanity in a single blow. In October 2017, I drove the quiet, empty border between China and North Korea, photographing across the two rivers and one mountain that divide them. I searched out locations closest to North Korea’s nuclear test sites, missile manufacturing facilities and military bases. Two weeks later, I traveled through equally quiet stretches of the western United States, from snowy North Dakota, where an all-seeing pyramidal radar complex stands, to the white heat of the cratered test site in Nevada’s desert. I climbed into missile silos, crawled out of bomber escape hatches, and wandered around command and control centers used during the Cold War. I was looking for parallels – visual, historical, factual, symbolic – between these landscapes. North Korea is the only country to have tested nuclear weapons in the 21st century. The United States is first country to test and only country to use them, in 1945. They are also locked in a rhetorical war attacking each other, with President Donald Trump taking swipes at North Korean leader Kim Jong-un as ‘Little Rocket Man,’ while his counterpart called him a ‘gangster fond of playing with fire’. Much of this takes place in the abstract – on Twitter, in newspapers or in theory. I wanted to see what the actual nuclear infrastructure looks like. I wanted to understand how these weapons work, what the command chain was, how we used them and might do so again. I wondered about the morality: what do we make of the repeated calls to ban these weapons on the one hand, and those who argue we need them for deterrence? With each site I visited, I felt the beauty and the weight of these landscapes and these quiet machines. 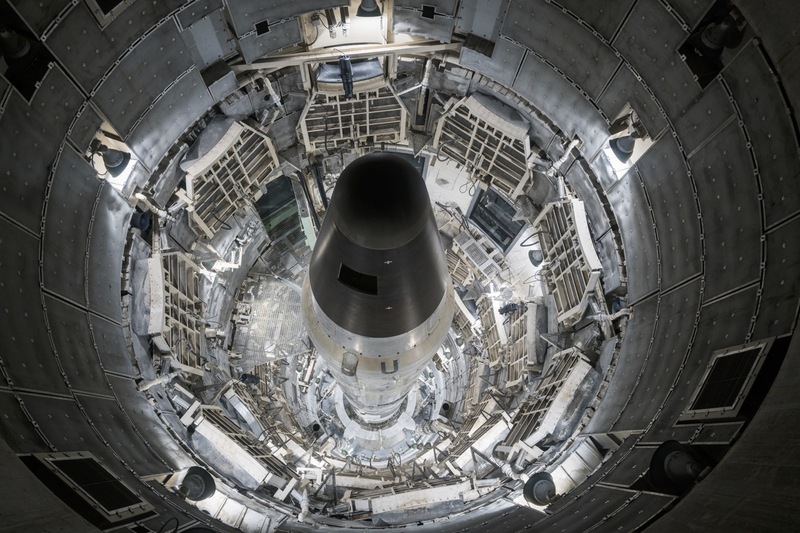 I had studied Cold War history at university, reading books and texts about that dangerous era, but suddenly these events came alive in the metres-thick concrete blast doors of the missile silos and in the rusty complexes far below ground. North Korea’s nuclear ambitions can be gauged only through satellite images, seismic tests, and propaganda pictures. That forced me to look through barbed wire fences, mountains and villages, metaphorically trying to see the missile sites and the Punggyi-ri nuclear test site where Pyongyang has conducted six nuclear tests since 2006. The lat-est and largest test had taken place just a month before my journey, causing buildings to shake, knifes to rattle in kitchens and schools to evacuate in neighbouring Chinese towns. In some ways, the landscapes were from a different era: farmers pushing carts at a gentle speed, single-storey houses with stacks of corn out front, steam-powered tractors, workers bicycling back to factories after lunch hour, and factory chimneys with wisps of smoke rising into the night sky. But the sense of tension was palpable: the regular guard posts on the North Korean side, and on the Chinese side the constant checkpoints and border police forbidding photography. In the U.S., I was welcomed in to look at decommissioned facilities preserved for tours and education, and sites that have been abandoned after having served their purpose. Only at the 3,500 square kilometer Nevada National Security Site – a still – active site – was I kept outside the fence as well. Over 900 nuclear weapons tests were done here between 1951 and 1992, creating a series of giant craters in the ground resembling a moonscape visible in satellite images. It was seeing an archival US military photograph of the largest of these – the Sedan crater – that first led me to think I could create a series of anonymised landscapes of these two countries that when placed side by side might let us suspend our sense of place and enter the realm of reflection and imagination.